During years I work in Propaganda Office for Brother Stalin, we learn of spurious allegory written by Capitalist puppet who say he Socialist, but know nothing of glorious Socialism. I refer of course to Englishman, George Orwell and silly book he writes, the Animal Farm. Though book only about animals that talk—such a ridiculousness that this day I still laugh—some say Brother Stalin hisself is now concerned maybe subversive animals read book and cause social unrest. Being good comrade I travel to Georgia to speak to farm animals about great Socialist revolution and nonsense in Orwell book. Soviet cows and hens like good Soviet comrades listen to message, but the swines are other story. They turn from my speaking to eat slops in trough. I say, "But Brother Swines who it is who brings food to you? Brother Stalin and Socialism!" They lay down and sleep in mud. This seem very suspicious behavior. Both intellectual and bourgeouis. No? I conclude swines read book. 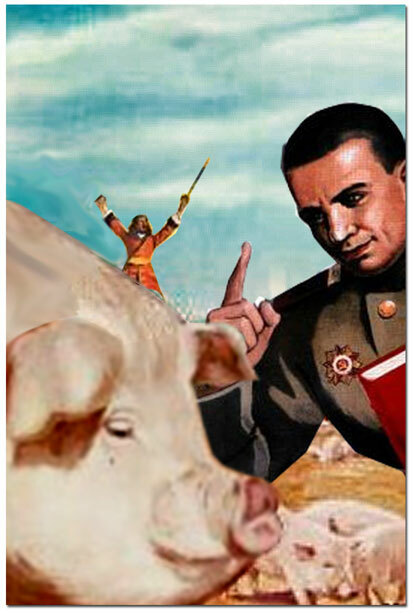 I report back to Propaganda Office and Brother Stalin ask that choices pigs be sent to his dachka for personal re-education under his great teachering. Perhaps swine learn. It was not my place to question what became of them. I just know efforts must have worked because no animal rebellion happen in whole history of Soviet Union.